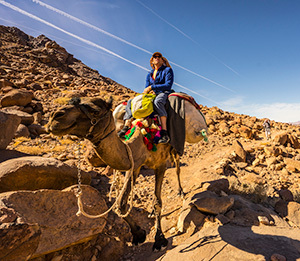 Adventurer and journalist Mark Jenkins, of Laramie, will share his latest experiences exploring the desert mountains of the Sinai Peninsula in Egypt during a free public presentation Tuesday, Feb. 27, at the University of Wyoming. Hidden in the heart of the desert mountains of the Sinai Peninsula are enormous walls and domes of red granite. 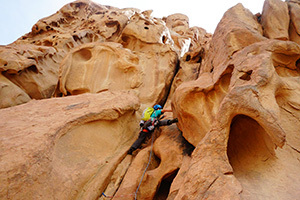 Last November, Jenkins, also a UW Center for Global Studies Senior Fellow, led a four-man team of Wyoming climbers to South Sinai. Besides Jenkins, the group included Micah Rush, of Casper; and Kyle Duba and Kyle Elmquist, both of Lander. The team lived with the Bedouin -- a grouping of nomadic Arab people who have historically inhabited the desert regions in North Africa, the Arabian Peninsula, Iraq and large portions of the Eastern Mediterranean. Jenkins says South Sinai is a pivotal region in the three Abrahamic religions: Christianity, Judaism and Islam. It was on Mount Sinai that Moses, according to the Old Testament, received the Ten Commandments. At the base of Mount Sinai lies St. Catherine’s Monastery. Built in 565, it is on that site where Moses saw the burning bush. With National Geographic images, Jenkins, during his talk, will present photographs of the people, the group’s climbing adventures and the landscape of the region. Jenkins will give similar presentations next month in Cody, Gillette, Jackson, Powell and Sheridan as part of the Center for Global Studies outreach efforts. UW’s Center for Global Studies and Office of Academic Affairs, Wyoming Humanities and the Rocky Mountain Power Foundation sponsor Jenkins’ discussions this semester. For more information, call the Center for Global Studies at (307) 766-3152, email globalct@uwyo.edu, or visit the website at www.uwyo.edu/globalcenter.